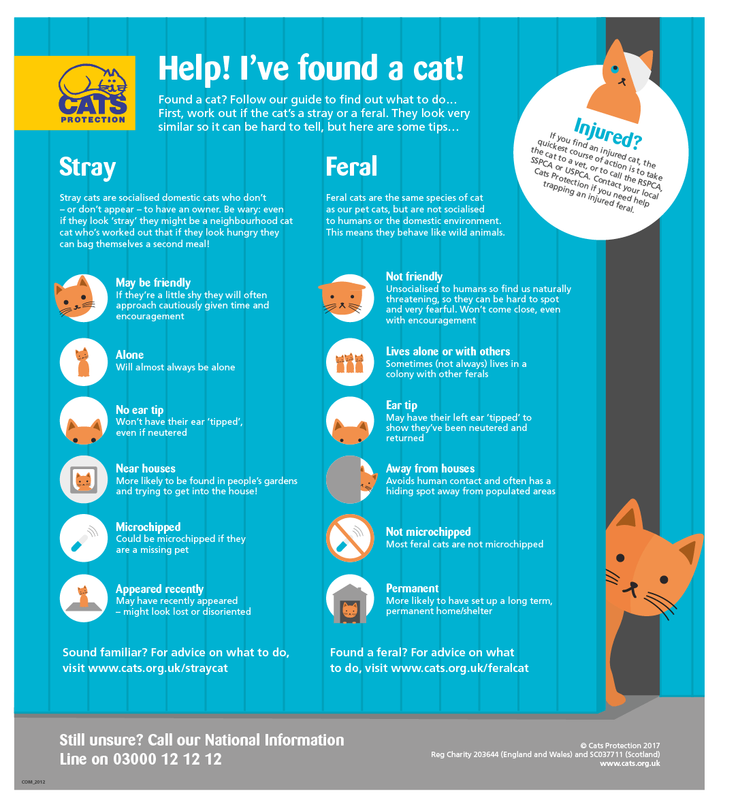 Important Information about re-homing a stray cat Is the cat really a stray? It is important that the ‘finder’ makes absolutely sure that the cat is not actually owned by someone living nearby. (i.e. if the cat is friendly and approachable). Before any rescue can take in a stray, it must first be ascertained that the cat does not have an owner. Ideally, the cat should be scanned by a vet to ascertain whether it has a micro-chip. All vets will do this free of charge.. Please check and if necessary register the cat on www.animalsearchuk.co.uk You could try putting a paper collar on the cat with your contact details and brief message. It would also be helpful if you could let us know how long the cat has been straying so that we can check our register of lost cats. Local vets should be notified as this maybe one of the first places someone will call when their cat goes missing. If you feel that the cat is ill or injured you should contact the RSPCA on 0300 1234 999 or take the cat to your nearest vet. 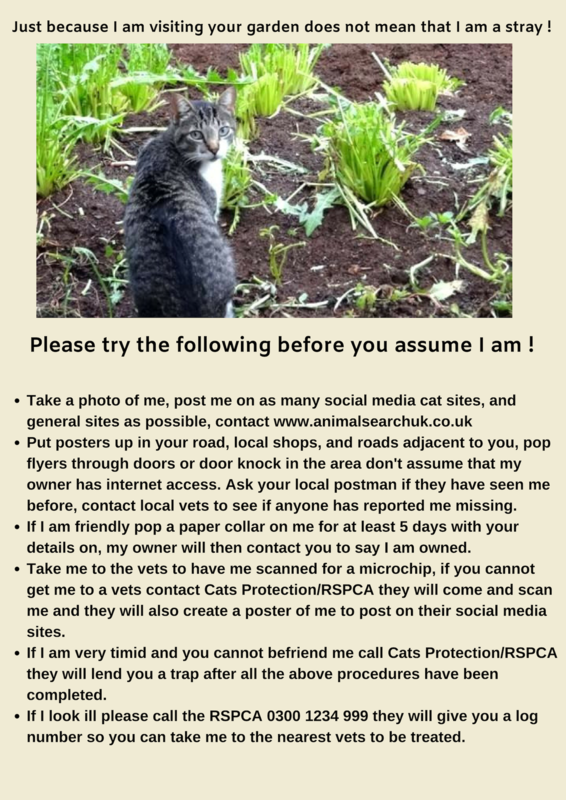 Create flyers to post through letterboxes of surrounding roads, attach posters to lamp posts, at your local shops with brief details of the found cat and a photo.Ask the local postman if he recognises the cat. Post on as many social media pages as possible do not just post on one site, there is a list of some of the sites you can try on our Facebook page. Loan of Traps Anyone wanting to borrow a trap can do so for a deposit of £20 which is refundable. The trap has to be used in a secure area. If it is not a secure area then a £100 refundable deposit is required. The borrower will also have to sign an agreement. Please call centre on 0345 371 4202 Please see our web-site http://www.angliacoastal.cats.org.uk/ (Lost & Found page) and Facebook page https://www.facebook.com/CatsProtectionAngliaCoastal.